MainAll NewsMiddle EastTony Blair Working for Israeli Captives' Release? Tony Blair Working for Israeli Captives' Release? Former Middle East Quartet peace envoy has met with Hamas leader Khaled Mashal in Qatar twice in recent weeks. 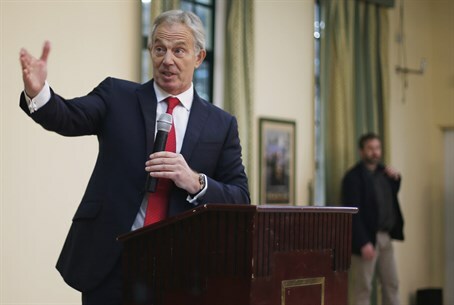 Former British prime minister Tony Blair may be serving as the intermediary between Israel and Hamas in talks over two Israeli citizens being held captive in Gaza, Russian media reported Saturday. It was cleared for publication Thursday morning that Avraham Mengistu, an Israeli of Ethiopian origin, was being held by Hamas, after having apparently crossed into Gaza last September. A second citizen, an Israeli Arab from the Bedouin village of Hura, is also reportedly being held by Hamas. A Hamas official told Sputnik that Blair, who recently stepped down as peace envoy for the Middle East Quartet, has been meeting with Hamas leadership on the issue and discussing solutions. It should be noted that Blair has in fact with Hamas leader Khaled Mashal in Doha, Qatar at least twice in recent weeks. Israeli officials refused to confirm the report, but did deny previous claims that Egyptian or German officials were serving as go-betweens. Egypt, however, did help mediate negotiations in 2011 between Israel and Hamas for the release of abducted Israeli soldier Gilad Shalit. After five years in captivity, Shalit was freed in exchange for the release of over 1,000 terrorists. On Friday, Prime Minister Binyamin Netanyahu met with the Mengistu family and vowed to "do whatever is needed to bring these citizens back home."